Is your organization interested in holding a can food drive for the Community Food Pantry? You're awesome! Click here to fill out an interest form and we'll get back to you soon to help you finalize the details of your food drive. We are always in need of adult and youth volunteers to serve, sort and stock for the pantry. Time served at the pantry may count towards community service hours for high school students in both public and private schools. 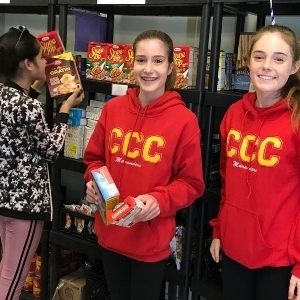 Community service clubs, sports teams, high school clubs, Boy Scouts, Girl Scouts and other organizations are encouraged to inquire for group projects or activities outside of the normal pantry operation. Visit our ONLINE SIGN UP for volunteer opportunities. Interested in bringing a group to volunteer? Contact us at villagecommunitypantry@gmail.com. Monetary donations made to the Community Food Pantry help get food on the table to those right here in the Tampa Bay community. We are able to purchase food at a reduced rate because we are an agency of Feeding Tampa Bay, allowing your dollar to go even further. Donations can be made online or in person at our office located at 13115 S Village Dr, Tampa FL 33618. What Does Your Donation Provide Others? Will you consider being a monthly donor to the Community Food Pantry? Community service hours will not be given in lieu of monetary or in-kind donations. We distribute 28,000 pounds of groceries a month. The most needed items in the pantry are non perishable items such as spaghetti sauce, tomato sauce, canned meats, peanut butter, canned vegetables and fruits, cereals and breakfast items, dried beans, pasta, rice, and macaroni and cheese. All donations must be unopened, in original packaging, and unexpired. Donations can be made in the office Monday-Thursday 9 am – 2 pm or on Sundays from 12 pm – 2 pm. When do you want to start your Food Drive? When do you want to end your food drive? Thank you for your interest in holding a can food drive for the Community Food Pantry! We will get back with you soon.